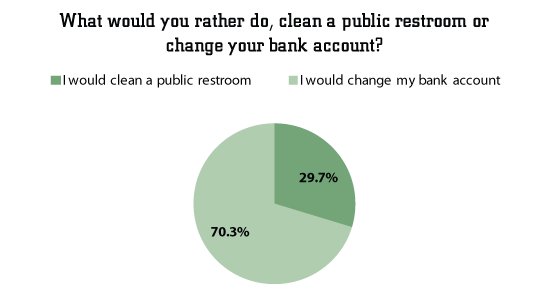 Almost 1 in 3 people (30%) would rather clean a public restroom than change their bank account. What does it take for a bank to lure new customers? $500 may not even do the trick. 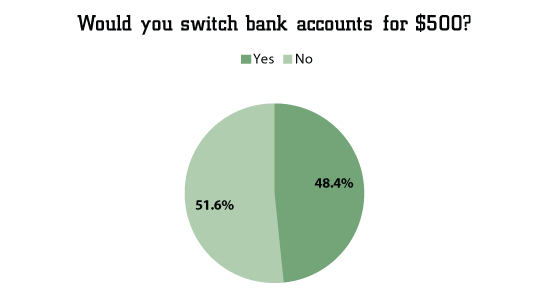 Over half (52%) would not switch banks for $500. $500 is a substantial amount of cash. Most bank promotions are much smaller, offering just $100 or $200, not to mention a ton of deposit requirements to fulfill. 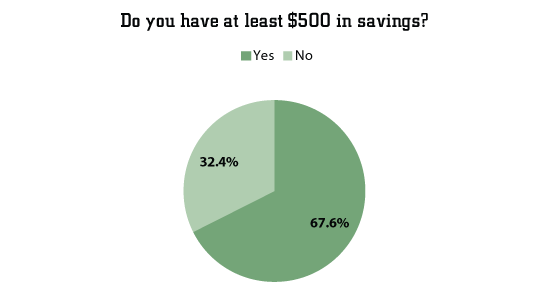 Nearly 1 in 3 people (32%) do not have $500 in savings. And yet, over half won't even switch banks for that amount. An extra $500 can go a long way in padding an emergency fund and providing a safety net. Even when it comes to our favorite guilty pleasures, most would choose to sacrifice them instead. Many Americans are more attached to their banks than to coffee, alcohol, and social media. 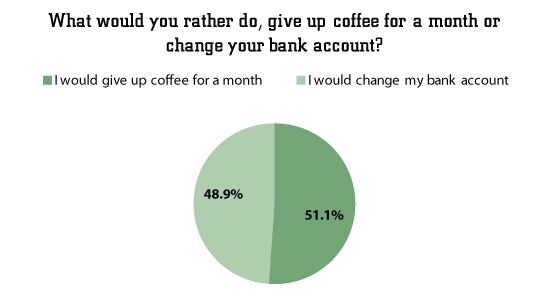 Among coffee drinkers, 51% would give up coffee for a month rather than change their bank account. 48% of males would give up coffee for a month. In comparison, 54% of females would give up coffee for a month. 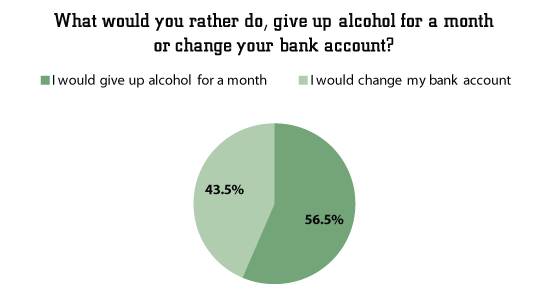 Among alcohol imbibers, 57% would give up alcohol for a month rather than change their bank account. 51% of males would give up alcohol for a month. In comparison, 63% of females would give up alcohol for a month. 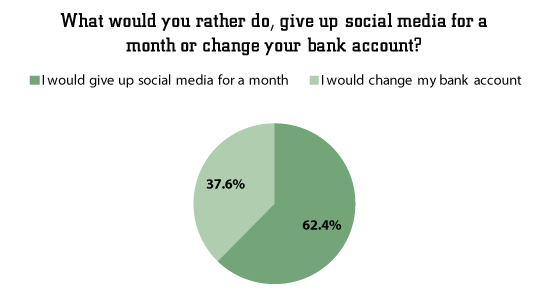 62% would give up social media for a month rather than change their bank account. 65% of males would give up social media for a month. In comparison, 61% of females would give up social media for a month. However, most people draw the line when it comes to the internet. Among people who use Wi-Fi, 66% of Americans surveyed would ditch their bank rather than live without Wi-Fi for a month. 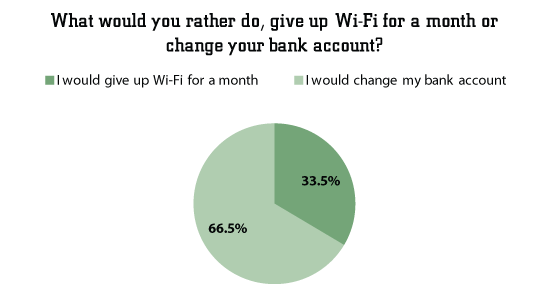 But still, this shockingly means that in our connected-obsessed era, 1 in 3 Wi-Fi users would rather go without Wi-Fi for an entire month than get another bank. Now what about our email addresses, phone numbers, and mailing addresses? Once we have them established, most of us stick with them until a move (or another big circumstance). They are core parts of our identity. 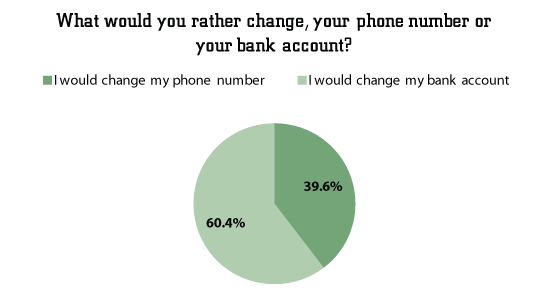 But a surprising number of people would go through the hassle of changing their communication information rather than their bank. 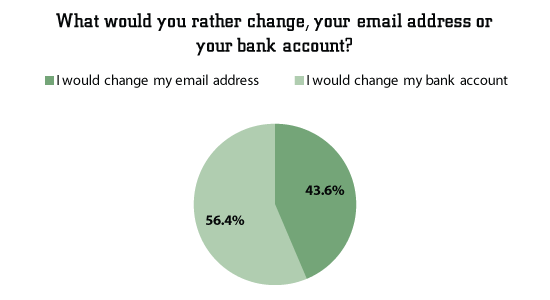 Almost half the people (44%) would rather change their email address than switch banks. Bank or phone number? 2 in 5 people (40%) would choose to keep their bank. 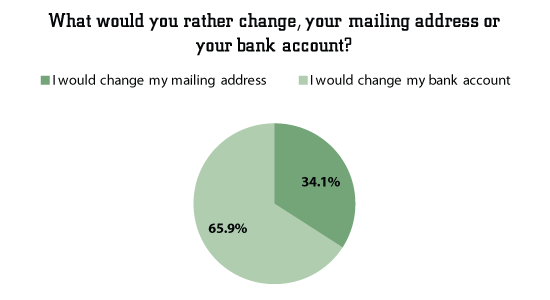 34% would change their mailing address rather than their bank account. People may complain about their banks all the time, but overall, our survey findings suggest that Americans are still attached to their banks. It takes a lot for a person to switch. Banks are constantly rolling out promotions to attract new customers, but, perhaps, they need to step up their game. Methodology: CreditDonkey conducted the online survey of 1,166 Americans, age 18 and over, between March 5, 2018 and March 7, 2018. The survey was conducted using Google Surveys. Survey results are representative of the U.S. internet population. Disclaimer: This content was first published on March 11, 2018. This content may have been updated on March 22, 2018. Information including rates, fees, terms and benefits may vary, be out of date, or not applicable to you. Information is provided without warranty. Please check the bank's website for updated information. October is the calm before the Black Friday storm for bargain shoppers across the country. But there are still amazing deals to be found. Share on Facebook "Survey: Bank Promotions"